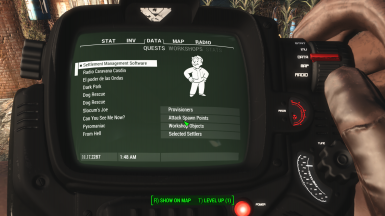 Modded by Snike/RobCo(TM) proudly presents the "Settlement Management Software" to help with your settlement management needs. It provides aspiring settlement leaders with additional information for a more efficient settlement management. 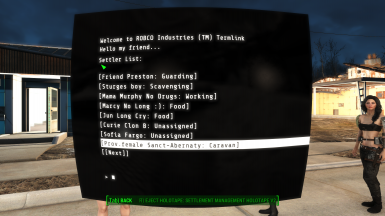 Now with Rename Anything Actors and Objects support (This shows the renamed names in this mod menu). Rename Anything It is not necessary but this modification is made to take advantage of the rename function that this mod provides. Snike - Terminal Tools V2 With Rename Anything It is not necessary, but it is useful to use the holotape anywhere. What's Your Name It is not necessary, but it is useful for change Actor names, alternative to: Rename Anything Mod. F4SE Required for correct Display Renames. Removed 3 unnecessary files from previous versions. 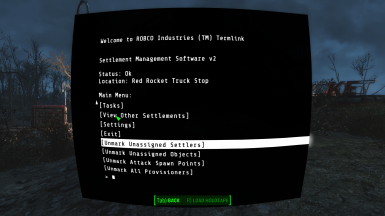 Fixed two Blank lists (that don't shows the settlements names) on move settler function and caravan Assign. Changed some Menu titles "Manage Settler" to "Manage Settlers". Added the option in main menu for quick unmark the Unassigned Settler, Providers, Attack Points and Objects. Add some implementation for being integrated in my other mod. PTT, (optional). Not Required. This is original work of matzman666 please give thanks to him. I only add support for the mod Rename Anything. It allow Actors and Objects renamed shows correctly in this mod and make it as ESL. Also works with the mod: What's Your Name. You can use my mod Snike - Portable Terminal Tools V2﻿ for use this tape or others that requires normal terminals in anywhere. RobCo(TM) proudly presents the "Settlement Management Software" to help with your settlement management needs. It provides aspiring settlement leaders with additional information for a more efficient settlement management. See details for every single settler. 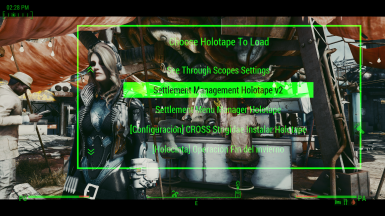 Just use this holotape on a terminal in one of your settlements. Many bugs reported in the original mod page in real are not fault of this mod, some dirty mods that adds new settlements don't setup them property in the game script registration of workshops, then this make that the workshop parent script not handdle it in the right way. 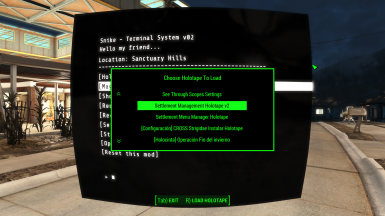 If you see Settlements without name, dupplicated or bad names, sorry you have one of this mods and these bad implementation cant be fixed in your saved games. Reset supply lines works fine. If you have problems with it, sorry you must read the past point, is the same answer.